It’s summertime, and that means it’s a great time to be outside exploring the great outdoors with your dog. Unfortunately, that also means mosquitoes, pests, ticks, and other pests are out in full swing. Fleas and ticks tend to live in tall grass low-growing vegetation along the side of trails or the woods. Avoid these areas as much as possible for the best chance of steering clear of them. You might not always be able to control where your dog goes, but you can pick a walking path that doesn’t include tick-prone vegetation. This is one area where it might be beneficial to ask around. Have other dog owners in your area found areas that are worse than others? It’s never great to benefit from someone else’s mistakes, but this is one place where doing so can help you and your dog in the long run. Early morning walkers take note: Mosquitos and other pests tend to be most active at dawn so use extra precaution if you are going on walks at that time. No matter where you walk, check your dog thoroughly for fleas ticks when you get home. You never know where it might pick one up! Use a flea comb and/or tweezers to remove any that you find as soon as possible. Proper grooming is also essential for keeping pests at bay. 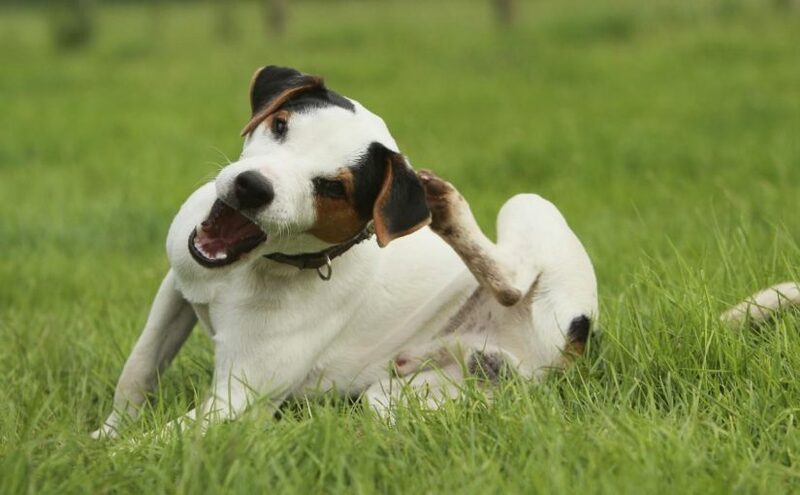 There are several natural remedies you can incorporate into the bathing routine to make your dog an unattractive location for fleas, ticks, and mosquitoes. Rinse fur with apple cider vinegar, which is a natural flea repellent. Your dog won’t be able to smell it or taste it, but the fleas will. Essential oils are another natural pest control solution. Lavender, peppermint and geranium oils repel mosquitoes. Lemongrass and geranium work against ticks. And peppermint repels fleas. These oils are widely available at natural food stores, or maybe even at the grocery store depending on where you live. It’s also important to wash bedding regularly when dogs are outside during the summer months. Fleas and other bugs caught in your dog’s coat may come out while it is sleeping, and you don’t want them hanging around if they do. Many products on the market can give your dog an extra layer of protection against pests. However, you need to be careful about dousing your dog in chemicals — much like you would read the label before using any type of bug spray on yourself. One of the worst things you can do is spritz your dog with the same bug spray you use on yourself. Most products made for people contain DEET, which is very dangerous for dogs. Exposure through the skin or even breathing it in can lead to neurological problems. Interestingly, the citronella found in many pest control candles can have the same effect. Keep your dog in mind when choosing locations for your outdoor candles. Don’t place them too close to the areas where they like to hang out. Your veterinarian can recommend pest repellents that will work for your dog and your situation. You may need to buy multiple products depending on where you live and what type of pests are prevalent throughout the year.